During this course, we are going to define cultural and linguistic competency. I will shorten that to “cultural competency” throughout the rest of the session rather than saying the longer full phrase, “cultural and linguistic competency.” We will discuss cultural and social factors that may have an impact on a patient's experience of illness. Finally, I will describe factors that affect a therapist's ability to provide culturally and linguistically competent care. We continue to have concerns about disparities in healthcare and the need for healthcare systems to accommodate increasingly diverse patient populations. Cultural and linguistic competency has become more a matter of national concern. Cultural and linguistic competency. But what is cultural and linguistic competency? Cultural and linguistic competency can be defined as “the capacity for individuals and organizations to work and communicate effectively in cross-cultural situations.” This capacity is supported through policy, structures, practices, procedures, and dedicated resources that take into account and are responsive to diverse populations, cultures and languages. The cultural and linguistic differences between you and your patients can result in miscommunication, a lack of understanding regarding their diagnosis or their treatment, and other consequences that can negatively affect their health outcomes. Developing cultural competency can help you to minimize communication errors, increase your understanding, and overcome barriers that may affect the care you are providing to your patients. Also, cultural competency includes increasing your awareness of communities and their perspectives, and becoming more self-aware of your own personal attitudes, beliefs, biases and behaviors that can impact your patient care. This can help you improve your patients’ quality of care, their access to care, and certainly, their health outcomes. Culture. Culture is the integrated pattern of thoughts, communication, actions, customs, beliefs, values, and institutions associated wholly or partly with racial, ethnic or linguistic groups as well as religious, spiritual, biological, geographical, or sociological characteristics. That is quite a mouthful. Culture is dynamic in nature, and an individual may identify with multiple cultures over the course of his or her lifetime. As we said, cultural competency is that capacity for individuals - and organizations as well - to work with and communicate effectively in cross-cultural situations. Culturally and linguistically appropriate services (CLAS). Culturally and linguistically appropriate services are services that are respectful of and responsive to individual cultural health beliefs, practices, preferred languages, health literacy levels and communication needs. These include any services employed by all members of an organization, regardless of size. In the handouts, I have included the National Standards for Culturally Competent Care; those are the CLAS standards. We are not going to review them in this course, but they are the guidelines for culturally competent care in various organizations. Persons with Limited English Proficiency (LEP). These are individuals who are unable to communicate effectively in English, and may have difficulty reading or writing in English. Limited English Proficiency refers to a level of proficiency that is insufficient to ensure equal access to services without language assistance. Health. Health encompasses many different aspects: physical, mental, social, spiritual and the like. Health disparities. Health disparities are a particular type of health difference that is closely linked with disadvantages. Health disparities adversely affect groups of people who have greater obstacles based on their racial or ethnic group, their religion, their socioeconomic status, their gender, age, mental health, physical disability, sexual orientation, etc. These are characteristics historically linked to discrimination or exclusion. Healthcare disparities. Healthcare disparities are differences in the receipt of, experiences with, and quality of healthcare that are not due to access-related factors or clinical needs, but rather to some of those other types of issues that we just discussed. So again, what is culture? Well, culture is learned, as we just said. It is transmitted from one generation to the next. You learn culture through interactions with others; by listening to, by observing, and assessing those interactions within your own family network. Culture is localized. It is from those interactions that you identify and learn what defines the cultural universe that you share with other members of your society. Those meaningful elements are shared by some, but not everyone, within that society. We need to recognize the difference; the fact that some in a community may share in these elements, while others do not. Culture is patterned. Patterning is essential for social behavior and the creation and maintenance of a society. It is essential for individuals within a group to develop patterns of behavior that minimize ambiguity and help them to avoid having to renegotiate every social interaction that arises. Culture confers and expresses values. Values define concepts and behaviors that are important to that cultural system. Those values are embedded in the culture and in the individual behavioral decisions and choices. Finally, culture is persistent but adaptive. So it is stable, but it also adapts. The cultural knowledge of an individual will continue to change over his life course as he encounters new objects, new situations, and different things in his environment. Those experiences will shape each individual person. Culture shapes our language, our behaviors, our values, and our institutions, and delivering care in a culturally appropriate manner is a key way to help improve quality of care for diverse patients. Culturally appropriate services are shown to improve quality, increase patient safety, and definitely boost patient satisfaction. The United States has experienced increased cultural and linguistic diversity over the last several decades. The United States Census Bureau projects that by 2060, the United States will become an even more multicultural society. Demographic changes within the healthcare workforce, however, have not kept pace with society as a whole. About 70% of the allied health workforce is white/non-Hispanic, and because of that, cultural competency takes on a whole new level of importance. Workforce diversity can lessen that cultural gap that might exist between the provider, and the patient coming from a different background. You can see in Figure 1 the anticipated demographic changes. Figure 1. 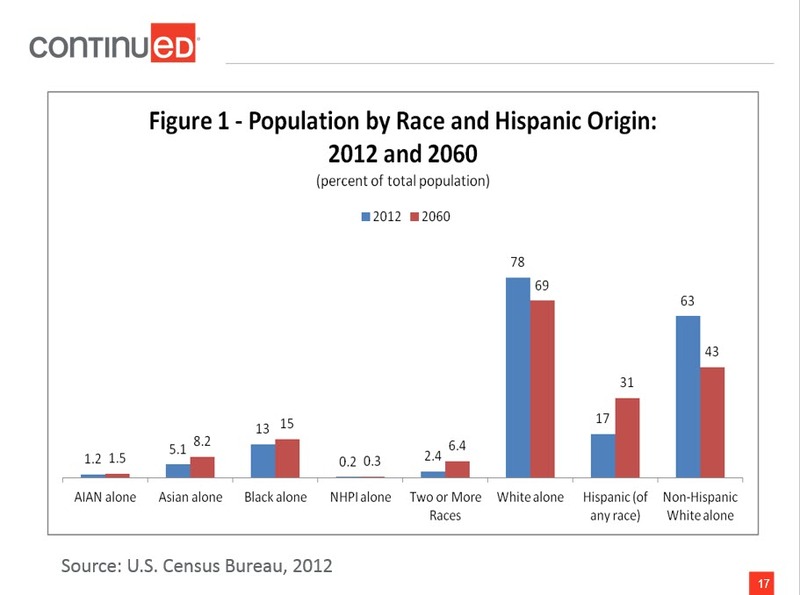 Population by race and Hispanic origin: 2012 and 2060. From 2012 to 2060, white non-Hispanics will remain the largest single group, but will no longer be a majority. Thomas Mesenbourg from the US Census Bureau said, "The next half-century marks key points in continuing trends. The United States will become a plurality nation where the non-Hispanic white population remains the largest single group, but no group is in the majority. As the US increasingly becomes a more multiethnic, pluralistic, and linguistically diverse society, the possibilities for misunderstandings, mixed messages and errors in communication are inevitable. To address and/or prevent these disruptive factors while delivering care, cultural competence and sensitivity must be added to the knowledge and skills needed for therapy practice in the future." That is a direct quote. Social determinants of health - including education, income, or access to healthy food - is a contributing factor, as are lifestyle choices, the degree of trust that we might have in a care provider, and the ability to pay for care, whether directly or through insurance coverage. Even the beliefs of healthcare practitioners can factor in. The health and healthcare disparities are well documented across many different cultural and linguistic groups. Individuals of different races, members of the lesbian/gay/bisexual/transgender (LGBT) community, individuals with physical disabilities, and individuals in rural areas all may experience health and healthcare disparities at some point during their lifetimes. Examples of healthcare disparities include the fact that racial and ethnic minorities experience disproportionately higher rates of chronic disease and disability, higher mortality rates, and lower quality of care compared to non-Hispanic whites. Suicide is the third leading cause of death among youth ages 15 to 24, and LGBT youth are more likely to attempt suicide when compared with their heterosexual peers. Individuals with lower incomes are more likely to experience preventable hospitalizations, compared to individuals with higher incomes. Again, delivering care and services in a culturally appropriate manner is one way that you can help to address health and healthcare disparities. Why does it matter? As I said earlier, culturally appropriate services are respectful of and responsive to individual cultural health beliefs and practices, preferred languages, health literacy levels, and communication needs employed by all members of an organization. In healthcare settings, culture and language differences can result in misunderstanding, lack of compliance to the plan of care that you have established, and other factors that can negatively influence the clinical situation. Providing culturally appropriate care is especially urgent, because research has shown that many cultural groups receive lower quality healthcare even when all of the other factors (e.g., socioeconomic or access) are controlled. Remember that cultural groups are not just racial or ethnic or linguistic, but can be religious, spiritual, biological, geographical, and can also include those who have limited English proficiency, limited literacy skills, or those who are deaf or hard of hearing. We will talk more about this, but bias, stereotyping and prejudice can also contribute to healthcare disparities. Let's look at those terms in a little more detail. Bias: Bias is a preference or an inclination, especially one that inhibits impartial judgment. It could also mean an unfair act or policy stemming from prejudice. Assumption: An assumption is just that; it is an underlying assumption and an unconscious, taken-for-granted belief and value that helps determine behavior, perception and thoughts. Prejudice: Prejudice is a negative attitude toward a specific group of people. Stereotype: A stereotype is an oversimplified conception, opinion or belief about some aspect of an individual or a group of people. Discrimination: Discrimination involves actions that deny equal treatment to persons perceived to be members of some social category or group. Everyone has biases. We all make assumptions about things and about other people. Those biases and those assumptions only become problems when they result in prejudicial or unfair treatment or discrimination, particularly when it involves the clinic setting. The Institute of Medicine (IOM) recommends that we adopt as our explicit purpose to continually reduce the burden of illness, injury and disability, and to improve health and health function. To reach that goal, we should aim to provide healthcare that is, first of all, safe, so as to avoid injuries from any of the care that is intended to help them. Care also needs to be effective, and based on scientific knowledge or the best available evidence. We must give the services to those who would benefit and refrain from providing services to those who would not benefit; in other words, we need to avoid overuse and underuse. Care should be patient-centered, so it is respectful and takes into account patient preferences, needs and values. It needs to be timely, so as to reduce waits and sometimes harmful delays for those who need it. It should be efficient, avoiding waste of equipment or supplies or energy. Lastly, it must be equitable. The care we provide to our patients must not vary in quality because of gender, ethnicity, geographic location, or anything else. Let’s look at some of the factors that may affect competency, beginning with self-awareness. Awareness of your own values and those of the healthcare system in which you work is the foundation of culturally competent care. We are going to talk about some more definitions, such as ethnocentrism, essentialism, and power differences. Those can all affect your ability to provide culturally sensitive and appropriate care. Those beliefs could be very much conscious beliefs, or they could be unconscious beliefs based on your background, ethnicity, culture, and upbringing. Ethnocentrism is a belief that “My way of life and my view of the world are inherently superior to, and more desirable than, anybody else’s.” In healthcare, this could prevent you, as the therapist, from working effectively with a patient who has beliefs or a culture different from your own, and that does not match your own ethnocentric worldview. When we don’t address ethnocentrism, it can compromise that patient-therapist relationship and lead to mistreatment, insufficient treatment, or, in extreme cases, abuse. Essentialism defines groups as “essentially” different, with characteristics that are “natural” to a group. It means believing that all folks in a particular group are one way; it is almost like labeling, if you will. Essentialism does not take into account any sort of variation within a culture. If we believe in essentialism, it can lead us to stereotyping. In doing so, your treatment would focus on your beliefs about a larger group, rather than taking into account that each individual may have his/her own preferences or values. Then there are power differences. You may not realize that these are there, but they are. These reflect the power imbalance in patient-provider relationships. Individuals with power may not even be aware of its daily effects. You may think that maybe you don’t have power as the therapist, but you do. In that relationship with your patient, you are seen to have power. Some cultural groups may feel powerless, quite frankly, when faced with institutionalized racism or other forms of privilege enjoyed by a dominant group. Without being aware of power differences and their effects, you as a therapist can perpetuate healthcare disparities. What we need to do is specifically learn about a patient's “truth,” if you will, that is formed by their culture, language, experience, history, and sources of care, and then try to integrate that. Every one of your patients will come to you with his or her own truth, and it is up to you to try to uncover what that is, and what their perceptions are. You may have some stereotypes about patients from various cultural or linguistic backgrounds. Some therapists may impose beliefs in their health system that contradict the beliefs of their patients. Our ways of speaking, such as speaking louder or speaking slower in an exaggerated way, may transmit biased attitudes more visibly than the spoken message. Even nonverbal, like your posture and mannerisms, may demonstrate that you have a stereotype, or convey a stereotype to your patient that you are not aware of. Kathleen Weissberg, in her 25+ years of practice, has worked in long-term care as a researcher/educator and has established various programs in nursing facilities including palliative care and end of life care, incontinence management, falls management and dementia care and staging. She currently provides continuing education support to 6000 therapists nationwide as Director of Education for Select Rehabilitation. Meditation and mindfulness practices have been shown to have a measurable and positive impact on the brain, the body, emotional regulation, cognitive-linguistic function and overall health. This course will review the research and instruct participants in specific, evidence-based techniques for integrating meditation into speech-language pathology practice.